He is very friendly and cute. He’s not like everyone else’s little brother because he’s got Hunters, and the Hunters makes him hit a lot. That makes me feel sad. He gives big cuddles a lot. He likes bananas. Danny likes watching TV and eating. He has got Hunters so he’s different from other children. He acts like a baby but he’s a toddler. I like him because he’s cute. He’s fun, cute and lively. Whenever you’re sad he always puts a smile on your face. He loves food. He loves telly. He likes playing football in the garden. He does funny things like calling everyone Dave. In the future I think he’ll be just the same as he is now, only older and not quite as cute. When my Dad picks me up I like it because Pudding always gives him something random from around the room. I sometimes worry that his new medicine will stop him being like Pudding. Who am I? Who am I? Not Jean ValJean, that’s for sure. But when I was listening to Les Miserables the other day, I realised that he had a point. We all need to be defined by something, and that something is ourselves. As with many mothers with young children I ended up subsuming my own identity a little into the daily grind of feeding and nappies and baby groups and weaning and nappies and …well, you get the picture. I was grateful that I didn’t have to juggle work and parenting, but I did lose something because of that. The world of work, although often stressful and with its own challenges can offer things too; a pay packet at the end of the month, a thank you, a simple acknowledgement of a task completed on time. . 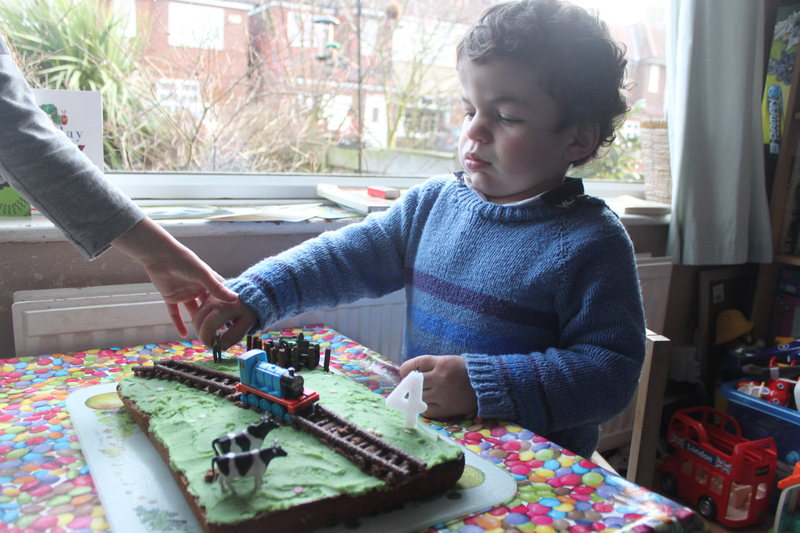 When my youngest passed the age of two I expected to be looking outwards again, planning a return to work, finding myself again after the years of baby-fugged-brain. Then his development delay became increasingly obvious and just as things should have started becoming easier, I found myself struggling even more. Hunter Syndrome knocked a couple more punches in, and has dominated my life for the last nine months now. Last week, at a writers’ group meeting I went to, we were asked to give our name and say something interesting about ourselves. It went round the table with people mentioning working in prisons, boxing for England and other fantastic things. Then it got to me. Who am I? There was so much I could have said, but instead my mouth opened and I blurted out that my son has a genetic disease. I could have kicked myself. Yes, it’s highly important to me at the moment, and I find it hard to think about much else, let alone write about anything else. But Hunter Syndrome IS NOT ME! I am not defined by my son’s disease. I need to learn to step away from it sometimes, and find myself again. So here is some of what I could have said. I have degrees in both Chinese and chiropractic. I love baking and made my brother’s wedding cake. I received a marriage proposal on a train in China. I had two home births. I was the only person in my class at school who answered yes to the question ‘Would you live on a desert island by yourself’. I once sliced the side of my finger off in a bacon slicer when I worked at a supermarket. Wow, it’s a pretty hard exercise to try and think of something interesting. But it has taught me a useful lesson. I need to make more of an effort to be me. Do some yoga. Get back to writing the novel. Clear out my wardrobe. Anything. It was Pudding’s birthday this week, and I’ve been surprised by some of the emotions it has thrown at me. Facebook of course delivers memories to me of previous years and previous birthdays. I look back at them and wonder how this can be the same family; they have never heard of MPS or Hunters, not had weekly infusions or sat anxiously through another surgery. I looked at a photo taken of him at only a few hours old and simply could not comprehend that this was the same boy who has given us love and worry in equal measures. For many MPS parents, I know birthdays and other events must be even more bittersweet; they can look back at previous years and remember ‘Back then, he could still walk/swallow/say ‘I love you’. I at least have so much to be grateful for: we can still see progress rather than regression. Last year, he would mainly play on a very physical and sensory level. Now he still very much enjoys crashing his cars off the windowsill, or flinging objects at us very hard. Yet when I unwrapped (yes, we haven’t quite got that concept yet) one of his presents to find a remote control car, he immediately sat down on the floor with it and tried to work the buttons, looking between the controller and the car. He knew what it was meant to do! He has come so far in a year, despite all the gunk clogging up his poor brain. Not as far as many other children will have done in the same time, but I am so proud of my little boy. When you spend longer than a few hours in one, time seems to stretch and contract in different ways. You enter a suspended state of animation where the hours are measured by the next set of obs (temperature, blood pressure and oxygen levels – every four hours), other tests or the regimented mealtimes. A trip outside the ward, even if it’s just to go get a coffee, feels like you have escaped illegally. Breathing in some actual outside air full of invisible pollution from the surrounding city couldn’t be better, even if it was fresh from the purest mountain resort. When Twiglet rings to speak to me on the phone before bedtime, I hardly recognise his voice. It seems impossible that he can be my son too; he exists on a different plane to me. Staff are wonderful at trying to make us feel relaxed and at ease but it is odd to have no responsibilities. I’m not able to make my child a piece of toast but I can tell them which size gripper needle to use. Freed from the restraints of tidying or washing up I find myself more able to sit and play with Pudding, truly enjoying being in the moment with him. Together we race cars down the ramp, and give Mr Potato Head an extra three arms. We’re of course in a privileged position – unlike many stuck in hospital Pudding isn’t unwell. Far from it. Apart from objecting to being pinned down for the dosing and many subsequent blood takings – 11 in 36 hours this time – he’s been having a whale of a time. Running around with the other boys on the trial, kicking a ball up and down the corridor, mesmerising all the nurses with his curly hair and lightning grin. He even got an early birthday cake and balloon octopus! We did have a bit of a worry initially, as his temperature went a bit high just before the dosing. I didn’t think I could bear having to cancel and come back the next week, but after we stripped him to his nappy, his temperature came down again and we got the go-ahead. The trial team had all the emergency medications ready in case of a serious reaction, but everything went smoothly. The new port worked just as it should; they were able to draw some CSF (the fluid that surrounds the brain and spinal cord) for testing and deliver the new drug. Unlike the weekly infusions, it was over so quickly; almost the longest part being the need to clean the area thoroughly three times to minimise the likelihood of any infection. So that’s it until next month. And the next few times we don’t have to have the blood samples done, so it will just mean two nights in the hotel and not having to sleep on the narrow pull-down bed. Hoorah! So this is it. We’re heading off to Manchester again later today. This could be the first week of the rest of Pudding’s life. The first dose of a monthly enzyme that could potentially halt the progress of this horrible disease. We’ve known about this trial ever since we first sat down to talk with the specialist consultant back in July. At that point we hoped to goodness that we would never need to learn any more about it, but of course that wasn’t to be. Once it was confirmed that Pudding has the most severe form of Hunter Syndrome, we had to face it. Clinical trials of course have an element of risk. There was very sad news lately of a trial for Duchenne muscular dystrophy being suspended due to the death of one of the participants. A different drug and a different disease, and the death may not have been caused by the trial drug itself, but it’s enough to make anyone stop and think again. Although other boys have been on the Hunters trial safely for a few years now, the numbers are still small. Could it be our son who reacts badly? It’s a risk worth taking though; the one thing I couldn’t bear would be to look back in ten years time and think, ‘We had a chance, but we didn’t take it’. So here we are, taking that chance. The dose will be given on Tuesday morning, but because of all the tests afterwards we don’t get to leave until first thing Thursday. Technology not always being my friend, I may not get a chance to update you until then. For now, wish us luck! I place him on my bed and pull the covers up over him. He snuggles down with a grin so wide it screws his eyes up. I lie down next to him and close my eyes. Sometimes he resists his afternoon nap; he’ll slither off the bed, throw cushions off the chair and clamber up to look out the window. He’ll tell me what he can see – ‘car!’ or ‘bir!’ – repeating the single syllable over and over again in the hope of getting a reaction from me. I pretend to be asleep, and pat the bed next to me and he eventually returns. Other days, he is so tired from his night-time partying or early morning wake-up, that he conks out almost immediately. Today it is an in-between day. He’s not in bouncy-Labrador-puppy-mode, or too exhausted. He chats at me for a bit, and shifts position a couple of times. I try not to look at him or I know he’ll want to play more. One stubby finger pokes me forcefully on the nose – ‘Beep!’ – then explores up under my glasses to squish my eyeball. I suppress an urge to giggle. His hand then reaches up to my hair; it’s just long enough now for him to twirl. He’s a little frantic at first, tugging and pulling as he tries to wind my hair in his fingers. Soon though, the habit calms him; the movement slows and ceases, his hand resting heavy on my face. I carefully lift his hand down. He startles and semi-wakes. 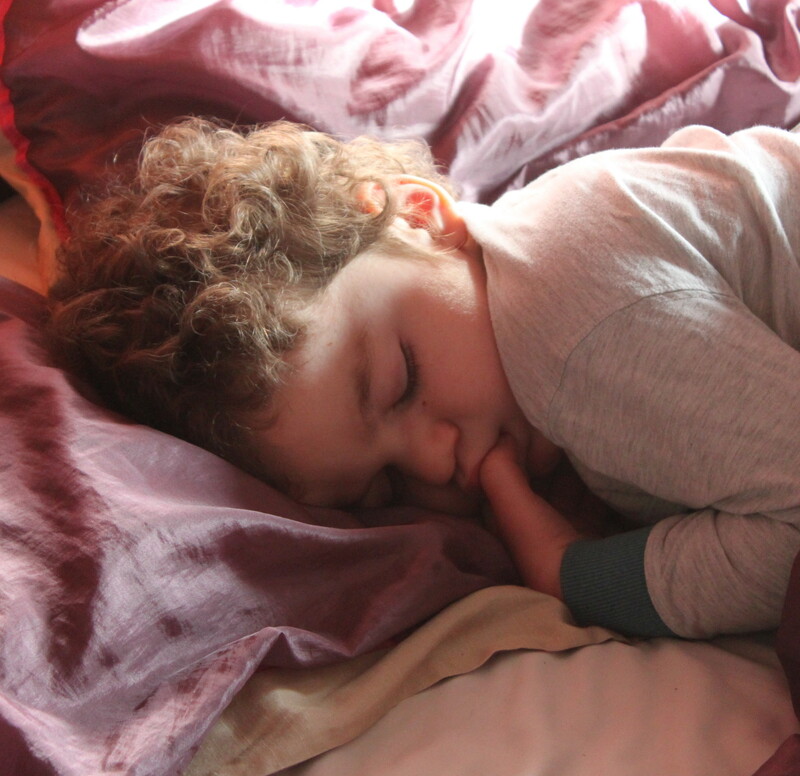 Shuffles round to tuck arms and knees under him, bottom in the air in classic toddler sleeping position. While I watch him sleep, all my worries about treatments, appointments and paperwork recede into the distance. Hunter Syndrome has less power over me. I gaze at his face and listen to the ever-noisy breathing. There are things I need to be doing – downstairs is a tip, and the washing basket is full again. They can wait. I’m busy right now.